Quirky and cozy, the Vancouver Maritime Museum houses more than 15,000 objects and 100,000 images in storage or on display. 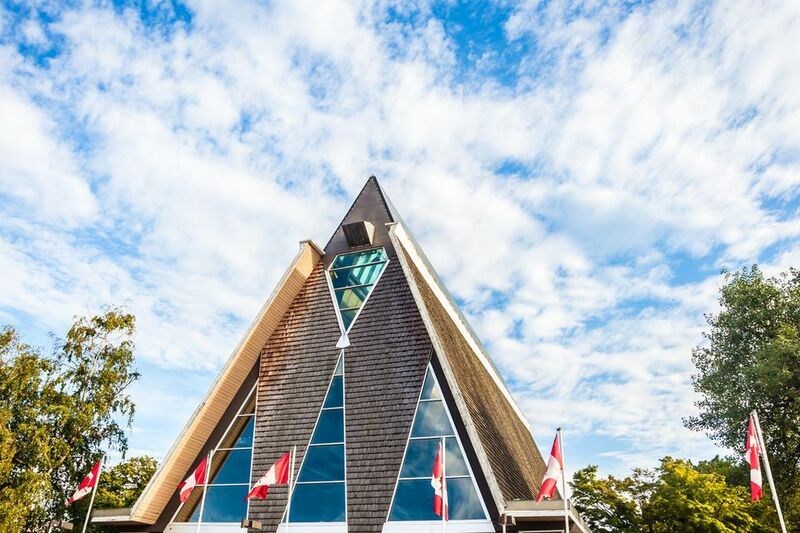 Located in Vanier Park, Kitsilano, the small triangular building is home to permanent and touring exhibits that celebrate maritime history. The Vancouver Maritime Museum opened in 1959 to preserve the maritime history of the Pacific Northwest and the Arctic as a part of a provincial Centennial project. In 1972, the Vancouver Museums and Planetarium Association began to manage the Vancouver Maritime Museum on behalf of the City of Vancouver. Ten Canadian museums, including the Vancouver Maritime Museum, share the ongoing story of the Franklin Expedition through pop-up displays and programming as part of the Franklin Museum Network. Vancouver Maritime Museum’s "The Franklin Exploration" exhibit examines the search for the lost ships of the Franklin Expedition, an Arctic venture that went badly wrong 170 years ago. The story began in 1845, when British explorer Sir John Franklin began an Arctic expedition to find the Northwest Passage and discover new scientific knowledge. Two ships, HMS Erebus and HMS Terror, with a combined crew of 134 men, set forth on the adventure. Three years later, the ships hadn’t returned home, prompting massive search efforts that were ultimately unsuccessful. Finally, HMS Erebus was discovered by archaeologists in 2014, and HMS Terror was found in 2016. The interactive pop-up display, "The Franklin Exploration," puts the mysteries of Franklin’s ill-fated voyage into a historical context of science and exploration. It looks at why the expedition took place and examines clues from early search efforts, while bringing an updated perspective on ongoing scientific research in Canada's North. "Across the Top of the World: The Quest for the Northwest Passage" is a permanent exhibit situated in the museum’s dry dock. It chronicles the centuries long search for the passage through the Canadian Arctic. Vancouver Maritime Museum is also home to a large range of archives and artifacts, such as navigational tools and charts, books, posters, and uniforms that are related to the area’s naval history, Vancouver’s waterfront, shipping, and recreational boating. Highlights include artist K.A. Colorado's "On Thin Ice" work, which is on permanent display in the lobby. Colorado’s Ice Core Sculpture Series features ice core sampling forms embedded with scientific writings, professional text, geologic material, and even animal DNA. St. Roch, the first vessel to sail the Northwest Passage from west to east (1940-1942), the first to complete the passage in one season (1944), and the first to circumnavigate North America, is on permanent display at the museum. The ship is made of thick Douglas Fir planks reinforced to withstand the pressure of the ice and built with an outer shell made of eucalyptus. Visit the National Historic Site of the ship and walk the decks, tour the interior cabins, and take the helm of the historic ship. Model ship fans can visit master builder Lucian Ploias at his shop inside the museum to see him create and restore model ships. He is usually in his workshop between Tuesdays and Thursdays. Other highlights include an intricate model of the French war ship, the Avenger of the People, which was built using pork bones from the rations of the French prisoners of war during Napoleonic times. At the Children’s Maritime Discovery Centre, kids can operate a submersible, ‘steer’ an English Bay tugboat and see the forecastle of Discovery, Captain George Vancouver’s ship. Outside the museum is the Ben Franklin, a yellow submarine that was the first submersible built specifically to drift in ocean currents. In 1969 the Gulf Stream Project saw six scientists live aboard the Ben Franklin for 30 days while drifting along the Gulf Stream. Visit the Heritage Harbour to see privately owned classic and heritage vessels at the Kitsilano quayside, close to the museum. Situated in Vanier Park, next to the Museum of Vancouver and the H.R. MacMillan Space Centre, the Vancouver Maritime Museum is a 15 minute walk along the seawall from Granville Island or a short boat ride on False Creek Ferries from the West End. The Vancouver Maritime Museum is open Monday to Sunday from 10 a.m. to 5 p.m. and from 10 a.m. to 8 p.m. on Thursdays. Admission costs for adults are $13.50, youths $10, student/senior $11, children under 5 are free.